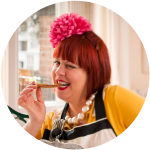 On May 3rd at 4pm Lavender Bakery, purveyor of exquisite cakes, and MsMarmitelover are holding an Underground tea. The theme will be Victoriana. It would be lovely if guests wore say a hat, or gloves, or brought a fan or if they felt like it, wore full-on Victorian gear! If the weather is nice it will be held in garden. Tomorrow Lavender Bakery and myself will have a joint baking session using the Aga. A glass of kir cava. Feel free to bring your craft item, knitting, crochet etc, that you are working on. Book at wegottickets.com (link in sidebar).